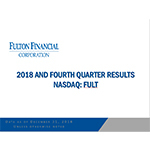 LANCASTER, Pa.--(BUSINESS WIRE)--Fulton Financial Corporation (NASDAQ:FULT) (the “Corporation”) reported net income of $58.1 million, or $0.33 per diluted share, for the fourth quarter of 2018, and net income of $208.4 million, or $1.18 per diluted share, for 2018. (1) Year ended December 31, 2018 is presented on a fully taxable-equivalent basis using a 21% federal tax rate and statutory interest expense disallowances. Prior period is presented on a fully taxable-equivalent basis using a 35% federal tax rate and statutory interest expense disallowances. Note: The weighted average interest rate on total average interest-bearing liabilities and average non-interest bearing demand deposits (“cost of funds”) was 0.73% and 0.55% for the year ended December 31, 2018 and 2017, respectively.